Here, pests enter the scene. When farmers are planting at different times, pests can move from one field to another, but when farmers plant in synchrony, pests drown and the pest load is reduced. So upstream farmers have an incentive to share water so that synchronous planting can happen. However, water resources are limited and there is not enough water for everybody to plant at the same time. As a result of this constraint, fractal planting patterns emerge, which yield close to maximal harvests. "The remarkable finding is that this optimal situation arises without central planners or coordination. Farmers interact locally and take local individual free decisions, which they believe will optimize their own harvest. And yet the global system works optimally," says Lansing. "What is exciting scientifically is that this is in contrast to the tragedy of the commons, where the global optimum is not reached because everyone is maximizing his individual profit. This is what we are experiencing typically when egoistic people are using a limited resource on the planet, everyone optimizes the individual payoff and never reach an optimum for all," he says. The scientists find that under these assumptions, the planting patterns become fractal, which is indeed the case as they confirm with satellite imagery. "Fractal patterns are abundant in natural systems but are relatively rare in man-made systems," explains Thurner. These fractal patterns make the system more resilient than it would otherwise be. "The system becomes remarkably stable, again without any planning—stability is the outcome of a remarkably simple but efficient self-organized process. And it happens extremely fast. In reality, it does not even take ten years for the system to reach this state," Thurner says. Spatial patterning often occurs in ecosystems as a self-organizing process caused by feedback between organisms and the physical environment. "The centuries-old Balinese rice terraces are also created by feedback between farmer's decisions and the ecology, which triggers a transition from local to global scale control," explains Lansing. "Our model shows for the first time that adaptation in a coupled human-natural system can trigger self-organized criticality." 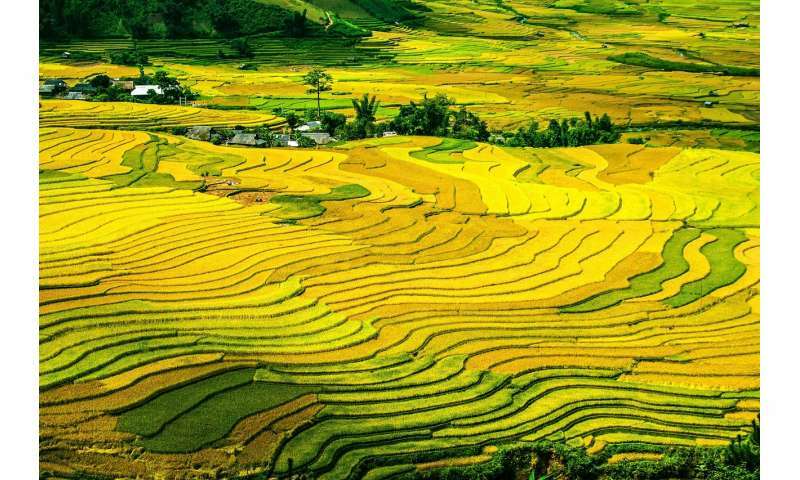 The Balinese rice fields could serve as an example that under certain conditions it is possible to reach sustainable situations that lead to maximum payoff for all parties, wherein every individual makes free and independent decisions. Sounds like quite an advantage to not hating your neighbors. Unfortunate that we live in a society that trumpets greed and selfishness as holy gospel. Now how on earth does someone misspell a word in TITLE?! yield not yeild! Editor? What is exciting scientifically is that this is in contrast to the tragedy of the commons, where the global optimum is not reached because everyone is maximizing his individual profit. This is what we are experiencing typically when egoistic people are using a limited resource on the planet, everyone optimizes the individual payoff and never reach an optimum for all,"
So this guy thinks it is remarkable that everyone looking out for their own interests actually works! Well, it has always worked. The "tragedy of the commons" is a steaming load of ..., which thankfully his research has debunked. Although I doubt it will overcome the overwhelming and false political bias this 'scientist brings to the table. Actually, what makes this case work is the unequal access to the main resource: water. The farmer upstream actually controls the availability to the farmer downstream, but he has an incentive to share in a way that his profit is maximized when everyone's profit is maximized. It just happens to be so by coincidence and circumstances. What we have here is not actually a situation of the commons. The tragedy of the commons arises where everybody has equal claim to a resource - that's why it's called "common" - where sharing means giving up your own profits. In those circumstances the common resource gets overused to the point of destruction because even as the resource starts to dwindle, there is an incentive to increase consumption lest your neighbor gets more than you. And besides, the tragedy of the common is not an argument against capitalism, or pro planned-economy and regulation as some seem to think it is, but actually an argument for private property: that there should not be these "common lands" which are collectively controlled. That is so exactly because the collective does not eliminate the greed of its individual members, and it ends up in the destruction of the collective property. The people can't maintain a lasting agreement about who gets how much, and it ends up Hatfield and McCoy. Even as you try to regulate access by authority, at best you run into crony capitalism where close buddies of the regulator get the first pick and the biggest profit. This was seen in the communist countries where everything from industrial pollution to simply maintaining the public infrastructure went neglected because nobody in particular was responsible of it - so it all fell on the easily abused central authority to decide. Maybe if yield was corectly speled in teh titel. These fractal patterns make the system more resilient than it would otherwise be. So this guy thinks it is remarkable that everyone looking out for their own interests actually works! Well, it has always worked. Most of the time everyone looking out for themselves does not work optimally. ...in a shared resource situation. The tragedy of the commons is not a universal rule, or some sort of argument against "capitalism" or the free market as it's usually misunderstood. It's just pointing out that the attempt of collective ownership tends to lead to unoptimal solutions when the individuals are greedy. In the opposite case of private ownership, greedy individuals try to best maintain their resource instead of overusing it. Uhhh...Who knew it was possible? The majority of commentators cogently expressing their viewpoints in a collective atmosphere of collegian competition. In the opposite case of private ownership, greedy individuals try to best maintain their resource instead of overusing it. Private ownership has its own existential problems: greedy property owners find their property advantages their accumulation of more, concentrating the property and devaluing that of others - so the greedy property moguls can acquire even more of it. Financial capitalism has another layer of existential problem, where the financial kingpins externalize the costs of acquiring and operating their property to either other property owners or to the commons. Corporate raiders who game systems to acquire capital cheaply then exploit its most accessible value before wasting the rest they abandon is quite common. Humans are disruptive and tend to waste regardless of the systems we live in. Everything has to be dynamic and honestly self-critical to achieve any kind of sustainable balance, let alone fairness. I don't think you know what that word means, but do go on. I don't see how this "concentrating of property" devalues other people's property through greed. Can you explain your point? For the financial markets, you are correct, because the whole "services" economy - for the part that doesn't serve manufacturing and production - is a bunch of nonsense to abuse the rules placed on ownership in order to gain tokens of value. I assume you mean "phrase": "existential problem". It's a problem upon which one's existence depends - or upon its solution. "Concentrating of property" devalues other people's property through greed. [...] explain [...]? The concentration of property itself devalues other people's property by giving the concentrators disproportionate power over the property. But far more often, though less directly, the concentration simply gives the concentrators power disproportionate to their share of the property they use to game the system, which they apply to devaluing others' property, so as to acquire it under advantage. the whole "services" economy - for the part that doesn't serve manufacturing and production - is a bunch of nonsense to abuse the rules placed on ownership in order to gain tokens of value. You'r'e just refusing to value labor in favor of valuing only property. That is in fact the precise definition of capitalism. And it's a fallacy: exchanging value or its tokens for labor or for property is valid. And that's not financial capitalism. Financial capitalism is the system that values only the tokens. Damage to the value itself is secondary to protecting tokens. Its masters live in two worlds, including the real one where the value itself is also valued. But they're driven by the financial, so the tokens are perversely valued higher - the tokens should have minimal value. The financial map is not the value territory, so they game the system through the mismatches. Primarily externalizing costs while capturing benefits. Greed makes a great equalizer in spaces open for topos theory. If you cannot get honesty, you wield metrics. Lessons from boson sampling do not ask. We are but one bump away from the cyclic conformal anthropic, if not chasing its shadow through non-communicative properties in multiple substrates. spaces open for topos theory [...] honesty, you wield metrics. [...] from boson sampling do not ask. People on drugs should not drive. Oh, E2. Thanks for assuming about SoE's lifestyle based upon a single comment he'd vouchsafed. Cause I'd thought he'd be satirizing us bombastically pendantic opionaitions. Whew! I missed hitting that bullet. [...]satirizing us bombastically pendantic opionaitions. You're welcome. I'm being charitable assigning the blame for your and their posts to hitting the pipe :). Where are the fractals in the field pictured above? My concept of fractals is that they are geometric patterns that repeat at all (or at least many) scales. Maybe someone can give us a better definition, but aren't there methods to evaluate the degree to which a given geometry is fractal? In this picture, all I see are remarkable layers of stripes having similar and conformal boundaries, with beautiful shades of yellow and green. Where are the fractal features that encompass many scales? The fractal structure here is probabilistic. The chance of viewing a certain pattern when your field of view is 100 sq mile is the same as the chance of viewing a similar pattern when your field of view is, say, 10000 sq miles. My understanding of the conclusions advocated in this article. Is that the writers and editors are, for this study, defining the concept of 'fractals' as repetitious patterns. Repetition in visuals. Repetition in private decisions that have a communal benefit. Repetition in social communications across individual preferences. Repetition in sharing the benefits of social stability. Is that the writers and editors are, for this study, defining the concept of 'fractals' as repetitious patterns. Here, we show that the spatial patterns observable in centuries-old Balinese rice terraces are also created by feedback between farmers' decisions and the ecology of the paddies, which triggers a transition from local to global-scale control of water shortages and rice pests. Note the word 'scale'. Fractality is a measure of self similarity accross scales. Where are the fractals in the field pictured above? The study doesn't mention fractals. It does focus on the patterns WRT to scale: "The spatial patterning that emerges is nonuniform and scale-free." The study treats with only the local (farmer) and global (region) scales. The study doesn't indicate *self-similarity* (symmetry) across scales, but rather self-organization at global scale from choices at local scale. There might be self-similarity WRT scale but the study doesn't say. "Fractal patterns are abundant in natural systems but are relatively rare in man-made systems," explains Thurner. The scientists find that under these assumptions, the planting patterns become fractal, which is indeed the case as they confirm with satellite imagery. But none of that was peer-reviewed. Baby monkies should not have to utilize controlled explosions in plastic boxes, but should be encouraged to have some caffeine and cortisol (coffee) in the event that they have too. I would trust some drunks on the road over sleep deprivation. Look at the number of accidents on daylight savings. Maybe we need a less central society, and thus less commuters, but then we wouldn't have the competition for ping at our data centers and those who abuse it. Only this article, with its quotes of Thurner, mention fractals. There's no mention of fractal relationships in the article, though the whole conclusion is with respect to (geographic) scale: local farmers' decisions self-organize the region as a whole for an optimized water sharing. None of the math in the paper looks fractal. Where do you see it other than in Thurner's (non peer-reviewed) assertions? Yes, but only on two scales. And the math they show isn't iterated functions. The paper talks a lot about the effects of local scale on global, but not symmetry between them. I don't know why Turner went further in presumably an interview for this article, but the peer-reviewed paper doesn't' say fractal. If it were fractal I'd expect the paper to be explicit. Maybe they're working on fractality for a followup. Or maybe peer review deleted fractal content from the paper. In any case it's irresponsible of both Turner and this article's anonymous author to feature "fractal" when the paper doesn't say so. Also to say fractal development is rare, despite its frequency in traditional cultures as I posted elsewhere in this thread. Spatial patterning often occurs in ecosystems as a result of a self-organizing process caused by feedback between organisms and the physical environment. Fractals are more than iterated functions with correspondences across a local and global scales. I'd like to see Thurner's fractal assertions vetted by mathematician peers. Fractals are more than iterated functions with correspondences across a local and global scales. Ah, I think you misunderstand what he means by fractal in his statement. He means the distribution has a fractal dimension (check out the wikipedia article on box counting for determining the fractal dimension. the images therein look very much like the rice paddy distribution). That assertion of fractality is not explicitly supported by the math in the paper. Lots of things look like fractals that aren't. Similarity between two scales can look like fractals without being fractal.